I have to keep trying to be perfect. No one can find out how lost and insignificant I feel. What if they knew who I really am? I could lose everything. Jennifer Crow seemed to have everything: a beautiful family, a music career, and a thriving ministry. Yet she was constantly trying to keep her life together, fighting against the secret fears that churned through her mind. Then she found herself in a major health crisis; her doctors were confounded. And she realized that her constant negative thoughts?key lies she had come to believe about herself?were literally crippling her body, mind, and soul. 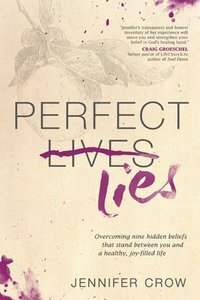 In Perfect Lies, Jennifer reveals the lies that held her back, walks us through her journey of miraculous recovery, helps us to identify these lies in our own lives, and shares practical techniques for overcoming them and finding true freedom instead.